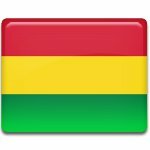 August 6 is Independence Day in Bolivia. This public holiday celebrates the establishment of the Republic of Bolivia (now the Plurinational State of Bolivia) in 1825. The territory of present-day Bolivia was conquered by the Spanish in the early 16th century during their conquest of the Inca empire. It was named Upper Peru. Originally Upper Peru was under the authority of the Viceroy of Lima, but in 1776 it was bounded to Viceroyalty of the Río de la Plata. On May 25, 1809, the citizens of Sucre (then Chuquisaca) organized a popular uprising against the colonial authorities. It was followed by the La Paz revolution. Both uprisings were defeated, but they sparked the Spanish American wars of independence. The Bolivian War of Independence lasted from 1809 to 1825. The independence of Upper Peru was officially declared on August 6, 1825. The newly independence republic was named Bolivia after Simón Bolívar. Bolivia Independence Day (Dia de la Patria) is a national holiday celebrated throughout the country. It is marked with colorful street parades, military displays, gun salutes, civic ceremonies, open-air performances, carnivals, dancing and other festive events and activities. The biggest celebrations are held in the cities of Sucre and La Paz. Sucre is the official capital of Bolivia, while La Paz is the seat of the government.